Is anyone concerned about this news that the earth may be running out of chocolate? I don’t want to seem dramatic about it but I’m not sure life is worth living without chocolate. Now, I know what you’re thinking, But Madame Paradox, what if someone decided that the only way to end global warming and close the hole in the ozone layer would be if we used all the chocolate as a patch? I’m not saying I wouldn’t agree to it, I’m merely suggesting I might need to take a spiritual pause prior to doing the right thing. Also, if I may be so bold as to suggest we start with the crappy milk chocolate and see if it holds before taking the drastic measure of using up the bittersweet expensive stuff? You know I believe there is a silo somewhere, Norway maybe, that is systematically collecting all the seeds from all the plant life we may ever need; lest blight or various and sundry forms of extinction have at it. 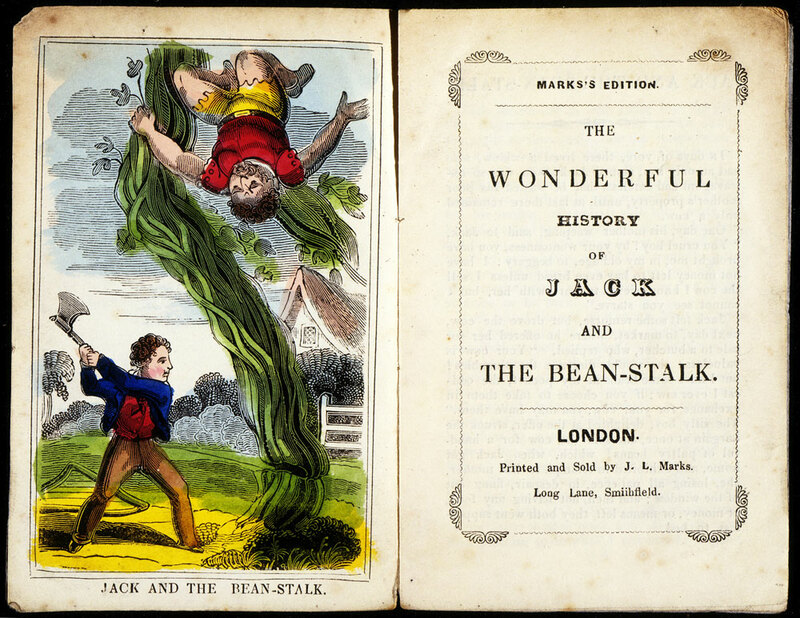 Come to think of it, couldn’t we borrow just a few beans, a la Jack And The Giant Beanstalk, and plant some cocoa trees? Not me, of course. As you all know I have a notoriously grey thumb. I just Googled cocoa — don’t looked so shocked darling it’s not against my religion — and it says we’re stealing pods, not beans. Seems like the chocolate shortage has an easy fix. Oh no, wait. Apparently cocoa trees only flourish in the hot rainy tropics. In other words, global warming is the culprit where our chocolate shortage is concerned. And yet it appears the only solution to regrowing the cocoa trees is to patch the holes in the ozone layer with chocolate. Well, that truly is a Gift-of-the-Magi turn of events, is it not? I still maintain if I ruled the world we’d borrow a pod or two and rebuild the chocolate supply. Also, If I ruled the world I would do something about the F train. For those who don’t live here, the New York City subway system is an overpriced and yet necessary evil if one is to get about without going bankrupt paying for taxicabs. Don’t talk to me about the bus. I have no intention of traveling above ground, that’s just madness. The subway lines have a random collection of identifying codes, some have letters, some have numbers, some may be referred to as both a color and a number. Some trains are local, some express. Unless of course it’s the weekend and the locals are running on the express track. Or the uptown express is running on the downtown track. Or the local is skipping all stops between 14th and 86th street in which case you have to go all the way up to 96th and switch trains to the downtown track. Trust me, it’s all crystal clear as long as you are a card carrying urbanite with a very strong will to live. Now then, back to the F train. 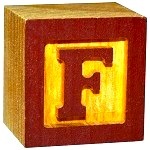 And ‘F’ in this instance does not stand for fabulous but ought to stand for flogging. Wait. Just hear me out. My particular stop on the F train involves four escalators down into the F-is-for-fiery pit of construction. Of course this month the elevator and one of the escalators is under construction. As a result they’ve turned the down escalator into an up, and the up into a down. Gosh this is starting to sound like I exist inside an Escher painting, doesn’t it? Hmm…that would explain an awful lot about my life. I don’t know why, but no one on the F train is willing to step into the car. If you have a backpack, a large piece of luggage, a garbage bag filled with life-sized knitting needles and twine, or possibly a giraffe on a leash riding a unicycle, they will all be standing in the doorway of the F train with no intention whatsoever of moving into the car. Which leaves me F-is-for-fuming on a daily basis. On the plus side, ever dream of directing a movie about the apocalypse? This is the subway for you. Take a look at these photos I surreptitiously acquired the other day. If they don’t say subterranean, dawn of the dead, nuclear fallout shelter then I don’t know what does. By comparison here is an incredible link to the worlds most beautiful subway stations. I know art and architecture like this would substantially improve my commute. I might even put a smile on my face when that Giraffe runs over my foot with his unicycle. Speaking of photos, take a look at this shot I took when I got off the F the other night. 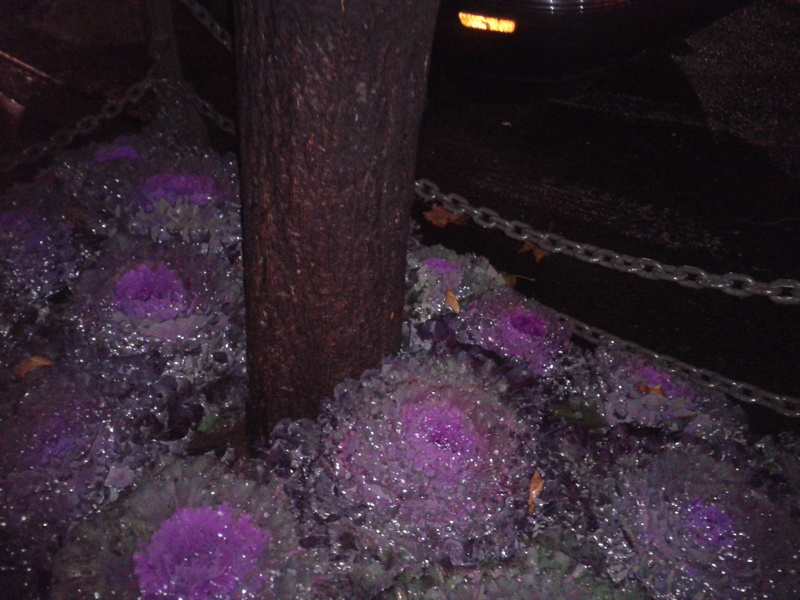 It’s called ornamental cabbage. With rainwater glistening on the leaves I thought it looked F for fantastic. Unfortunately the flash on my camera caused a large rat to run out from under the shrubbery. His name was Claude, and he didn’t care for chocolate. So obviously he and I will never have a relationship. Also he’s a rat for heaven’s sake. What kind of a sick twist of a woman do you think I am? The thing about perpetually-under-construction subway stations and vermin-sightings after dark is they create a kind of F-is-for-fortitude mentality in this urban dweller which isn’t always a bad thing. I do like to joke and whine about the trials and tribulations of living in NYC. But I’m also mindful that those seeds pods of adversity often sprout beautiful and abundant cocoa trees. For example, temporarily I started walking on the opposite side of the street since Claude-the-Rat and I are not speaking. As a result I noticed this brownstone that has stunning pieces of modern art hanging in a picture window on the second floor. Also, a few steps up was some lovely art deco metal work I had never noticed before. So you see if I hadn’t crossed the street I never would have discovered these things. I should probably mention I’m pretty sure it’s against the law for me to snap photos in the subway. If homeland security takes me into custody after I post this you will bail me out, won’t you? Try offering them some milk chocolate, I hear it’s very good for patching holes in the ozone layer. This entry was posted in Uncategorized and tagged chocolate, Construction, F-train, fable, Humor, Mass transit, New York, NYC, satire, Subway. Bookmark the permalink.